DUBUQUE, Iowa (CNS) — Catholic Charities of the Archdiocese of Dubuque is preparing to end its refugee resettlement program after 77 years in operation. The primary reason the program is closing down is because the numbers of refugees are down. The U.S. Department of State decreased the number of refugees who can legally seek refuge in the United States from 110,000 to 45,000 annually. Also, the department’s Bureau of Population, Refugees and Migration recently announced that all refugee resettlement sites across the country will be required to resettle at least 100 refugees annually to stay open. These federal changes are happening when the needs of local refugees also are being met by other groups, and as a result Catholic Charities will not be able to meet the new minimal threshold required. “Our faith guides us to believe in the dignity of all persons and the need to protect the most vulnerable, especially refugees and migrants. It is with a heavy heart that we announce the ending of this ministry,” added Dubuque Archbishop Michael O. Jackels. 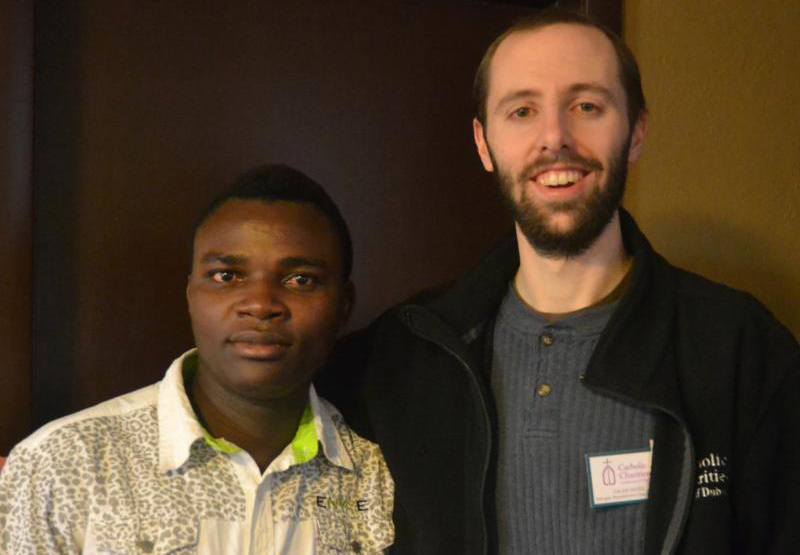 Catholic Charities’ refugee resettlement program employed three full-time staff and two AmeriCorps members. There also were other staff members at the agency who didn’t work in the program directly, but their jobs will be impacted. “Some employees will be laid off, others will be transitioned into other ministries,” Morrison told The Witness, Dubuque’s archdiocesan newspaper. Catholic Charities will continue to help newcomers to the country through the agency’s legal aid program for immigrants. Morrison said the demand for legal services is so high that the charity is looking into hiring another attorney. “We worked (with those who had) U.S. ties. The refugees who arrived here always had family,” she said. One particularly heartwarming scene Ready said she’ll always remember was an airport arrival where a father got to meet his son for the first time because his wife was pregnant when they were separated. “Getting to witness those moments and to hear families say they finally feel at home and they’re happy to be back with their family, that’s the most memorable,” she said, adding that she hopes other groups will be able to continue this service. Catholic Charities has been providing key assistance to refugees for a 90-day period after they arrive as part of an agreement with the U.S. government. They received federal funds for this purpose as one of several approved refugee resettlement providers in Iowa. In December, they began assisting a family and another individual, and will stay with these cases until the 90-day period is concluded. After that, the agency’s resettlement program will end. In the past year, they assisted 49 refugees, down from 94 the previous year. “Prior to these December arrivals, we had not resettled a family since June and so our program has been slowed down substantially by these decreasing numbers,” said Morrison. Catholics from the communities where refugees were settled have played an important role in recent years, doing everything from mentoring refugees to providing material support, according to Ready. “The volunteers are really the ones that help them go from surviving to thriving and becoming comfortable in the community,” she said. Morrison said Catholic Charities also would consider reopening the resettlement program should conditions change. For now, it remains committed to supporting refugees and immigrants through its Immigration Legal Services ministry available in several Iowa locations.